It is the spirit that powers the Scottish economy, and now whisky is to be used to create electricity for homes in a new bioenergy venture involving some of Scotland‘s best-known distilleries. 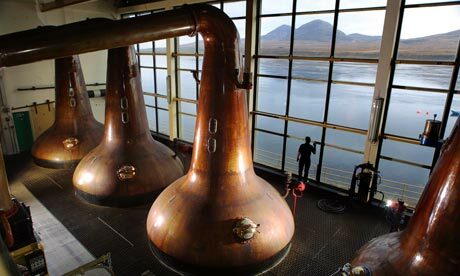 Vast amounts of “draff”, the spent grains used in the distilling process, and pot ale, a residue from the copper stills, are produced by the whisky industry each year and are usually transported off-site. The Rothes project, a joint venture between Helius Energy and the Combination of Rothes Distillers (CoRD) will burn the draff with woodchips to generate enough electricity to supply 9,000 homes. It will be supplied by Aalborg Energie Technick, a danish engineering company. The pot ale will be made into a concentrated organic fertiliser and an animal feed for use by local farmers. Environmentalists have expressed concern that some of the wood used in the process may not be locally sourced, but say the 7.2MW project – the equivalent output of two large wind turbines – is a good scale and a valuable addition to Scotland’s renewables industry. Green energy has been a key issue in the run-up to Thursday’s Holyrood elections. The SNP leader, Alex Salmond, has pledged to produce 100% of Scotland’s electricity through renewable energy by 2020, a claim dismissed as “fantasy” by Labour. The £50m Rothes project is the latest bioenergy venture from the Scotch whisky industry, but it is believed to be the first to provide electricity for public use. A bioenergy plant at Scotland’s largest distillery in Fife is close to completion. The project by Diageo will provide 98% of the thermal steam and 80% of the electrical power used at the Cameronbridge distillery. And last year, scientists at Napier Universityannounced they had developed a method of producing biofuel from the by-products of the whisky distilling process which could power cars and even aircraft. The new fuel, they said, could be available at petrol pumps within a few years. Of Scotland’s 100 whisky distilleries, 50 are based in Speyside, and Frank Burns, general manager of CoRD, said it was an ideal location for the new bioenergy plant which will be built on an existing industrial site. Waste products from around 16 of the area’s 50 distilleries will be used at the site, including well-known brands such as Glenlivet, Chivas Regal, Macallan, and Famous Grouse. None will come from further than 25 miles away. Burns acknowledged, however, that some of the wood for the process may not be locally sourced. “Some of it will be local and some of it will be shipped in,” he said. “It is down to the supplier. They may source it locally.” Most of the fuel, he added, will be comprised of the draff.